---You used to play as principal at Hannover Radio Philharmonic Orchestra (NDR) before joining Vienna Philharmonic Orchestra (VPO). Is there any influence onyour style in playing as a result of changing affiliation? Walter Auer : Yes, I would say that my performance style has changed drastically. I am convinced that I have changedsome aspects of my playin in the last 5 years. Importantl, the motivation and energy that I recieve from these orchestras is very different. I had a very hard time when I just joined VPO 5 years ago, as I had to learn a lot of new repertoire for the opera performances. I was so busy just coping and following, and was not able to express myself with my own style as freely as I do now. But I have been able to reach new aspects of my own performance through the tough times that I went through at the beginning of the last five years. Also, great conductors, colleagues and the general environment played crucial and significant roles in making me grow. --- Could you share your experience of any particular concerts that impressed you? The quality of concerts is greatly influenced by various such as the audience, which makes live performances very different from studio recordings. No two performances are ever the same. It is often unforgettable for me when we are able to give an inspired, realy good performance. When I reacall, it was for example a performance of Brahms's Symphonhy NO.4 that was very exciting and I haven't forgotten since. I played it as a member of the VPO for the first time right after I got the position there. Other memorable performances include Parsifal conducted by Simon Rattle, Bruckner's Symphony No.5 by Harnoncourt, Shostacovich's Symphony NO.5 by Marris Jansons played in NY, Figaro played in Salzburg, and so forth. There are plenty of performances that became lasting memories. Some of them have been recorded and have been published. Do you listen to audio CDs, by the way? --- Yes, I do. I prefer live recordings to studio recordings, though. Studio recordings can be completely edited and kind of boring. Yes, that's right. Studio recordings are really completely different from live performances and require a completely different approach. One of my colleagues, Dieter Flury (belonging to VPO), also prefers live recordings. He has just released an album that is a fulll-length uncut recital. It is really appealing, as it sounds very much alive, without cuts! --- Do you have any particular stress relives to handle your tight schedule, as it seems that VPO is one of the busiest orchestaras on the globe? I run regularly, about 4 to 5 times a week. I have participated in three marathons here in Vienna. In the long run, I would really like to take part in the NY, Berlin and Tokyo marathons! Besides, I enjoy biking, swimming and playing tennis, as I like exercise in the open air. My next big project is taking part in my first triathlon in 2008! --- Is there any big advantage of developing muscle strength? Well, to have a good understanding of how one's body works is more important for players than gaining muscle and body strength. It is essential for us to understand the functioning of our system fully. How to control the airflow and your breath, which parts of your body's movement influence sound production. All this reflects on your performance. 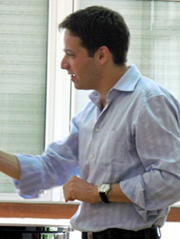 --- Could you briefly share with me how you teach students at your master classes since you have held them worldwide? Often, I play for my students to give them an example. I believe this is a very good way of teaching, but I don't expect them to adopt my style, as it is just one example among many. In trying to meet each studnes's needs, what comes first for me is trying to understand what they want to learn. Then I really try hard to enable students to become their own teacher: they have to listen carefully to their own playing and be able to comment on it. They have to learn that they are responsible for their own playing, their interpretation. That technical facility and ease is a given nowadays goes without saying. Being a teacher brings great responsibility. We teachers ought to prepare well as students invest a certain amount of time to attend our master classes. I commit myself to being completely honest with my students. I usually say what has to be said, even if it's something that my students may not want to hear. I do my best to convery precisely what I mean, but not too rigorously, I hope. What I focus on at my each master class is to work as a motivator in a musical aspect rather than on a technical level. What is especially important to me is sound and sound production. I strive for a relaxed sound that carries well and has a lot of possibilities. --- You now use a Sankyo 24K Gold Flute. It must have been very challenging to swich from your former silver flute to a 24K gold flute. What was the most important reason for you to change your instrument? I had been looking for an opportunity to explore my potential. In the flute world, things are always changing. New techniqes and materials are provieded to the market regularly. I tried as many flutes as I can, for I wanted to keep up with any kinds of changes occurring. In the past, I was never very comfortable with playing golden flutes, maybe because I hadn't had the opportunity to try a really good one until I encounterd the Sankyo 24K Gold Flute that you recommended to me. It was a stunning encounter! The very night I "met" this flute, I played Parsifal with it, and followed up the next night with The Cavalier of the Rose (Der Rosenkavalier). It was such an exciting experince even though it was hard and risky, as I wasn't used to the instrument. One of the most important things about musical instruments in general is whether they have potential or not. Instruments that have a multitude of colors and sounds give players enormous possibilities. Gold flutes in general have a beautiful sound but sometimes that's it. --- How was the Sankyo's 24K in that respect? This Sankyo 24K flute allows me to play plenty of colors and dynamics at will. Everything is possible with this flute, from an incredibly sweet sound to rough accents, whatever I want. Today's flute manufacturing technologies are so far developed that basically any flute would be playable in an orchstra. But only a few instruments have a unique sound. Let's say there is a pyramid formaed by lots of flutes in the world, but at the top are remarkably few flutes that have some kind of claim to uniqueness. That is why I am so happy to have met my Sankyo 24K. Thre is no doubt that it has already become a part of me. 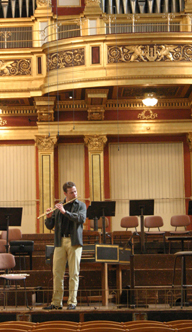 Walter Auer is principal flute of the Wiener Philharmoniker, a position he has held since 2003. Before coming to vienna he was principal flute solo of NDR Radio-Philharmonie Orchestra Hannover from 2000-2003. Prior to his appointment there, he served as principal flute solo of Dresden Philharmonic for one year. Auer, born in Villach/Carinthia, began flute lessons at the age of ten and from there went to study with Prof. Johannes Kalckreuth at the Kearntner Landeskonservatorium in Klagenfurt. In this time he was awarded several time for first prize at Austrians youth competition "Jugend musiziert“ and a member of Gustav Mahler Youth-Orchestra under Claudio Abbado. He subsequently studied with Michael M. Kofler at the University "Mozarteum" in Salzburg and finished his studies with Andreas Blau and Emmanuel Pahud at Berlin Philharmonic-Orchesterakademie in Berlin. Several masterclasses held by Aurele Nicolet had an importent influence. Additional awards include the second prize at the International Flute competition in Cremona (1996), the first prize at the Deutsche Musikwettbewerb-Kammermusik in Bonn (2000) and the second prize with Orsolino Quintett at the International ARD Music competition in Munich (2001). Walter Auer frequently appears as soloist in recitals and concerts around the world. He made his Musikvereins-Hall Debut as soloist with Wiener Philharmoniker under Daniel Barenboim in 2004 and he also has performed there 2005 as soloist with Wiener Philharmoniker and Cecilia Bartoli. As principal flutist WalterAuer is performing with the most famous conductors in Wiener Staatsoper and with Wiener Philharmoniker like Zubin Mehta, Riccardo Muti, Seiji Ozawa, Simon Rattle, Christian Thielemann, Nikolaus Harnoncourt, Daniel Barenboim and Mariss Jansons. He is in demand as coach and teacher, and has led masterclasses in Europe and Japan. 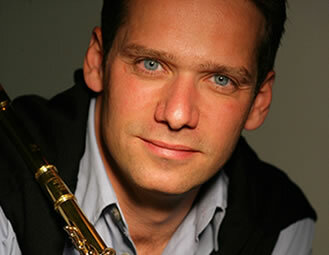 As a passionate chamber musician Walter Auer is also a member of "Orsolino Quintett“ and "Wiener Virtuosen“. Walter Auer is using a 24k SANKYO Flute and a headjoint from Werner Tomasi/Vienna.